The Levitt AMP Middlesboro Music Series ends on a high note with critically acclaimed bluegrass darlings Whiskey Shivers, playing a FREE show tomorrow at 6PM! They’ve dazzled Levitt audiences in Denver (July 2017), Los Angeles (July 2014) and Arlington (September 2014) with their brisk energy and virtuosic folk spirit. Their theatrical, interactive performances have captured the attention of publications like NPR, The Washington Post and Rolling Stone. Middlesboro, mark your calendars because you don’t want to miss this one! Whiskey Shivers’ high-octane Americana coalesced as a chance connection over Craigslist – fiddle player Bobby Fitzgerald and bassist Andrew VanVoorhees met after VanVoorhees posted a tongue-in-cheek ad seeking accompaniment for his “magical abilities on the upright bass.” Eventually, the rest of the band – Joe Deuce, Jeff Hortillosa and James Bookert – organically joined forces in the tight-knit music scene of Austin, Texas. With four albums under their belt, critical acclaim from far and wide and a flurry of tour dates, it’s clear the band is only climbing upwards from here on out. Their latest and somewhat unexpected development is an upcoming role in the feature film Pitch Perfect 3, as a folk band covering hit songs like Avicii’s “Wake Me Up” and The Cranberries’ “Zombie”! This kind of exposure will surely help Whiskey Shivers to continue showcasing their fiery, unique blend of punk rock and bluegrass all over the country – whether it’s in dimly-lit basements, festival stages or free, outdoor concerts. Make sure you get a taste of their spectacular musicianship tomorrow at 6PM at the Levitt AMP Pop-up Park, Middlesboro! 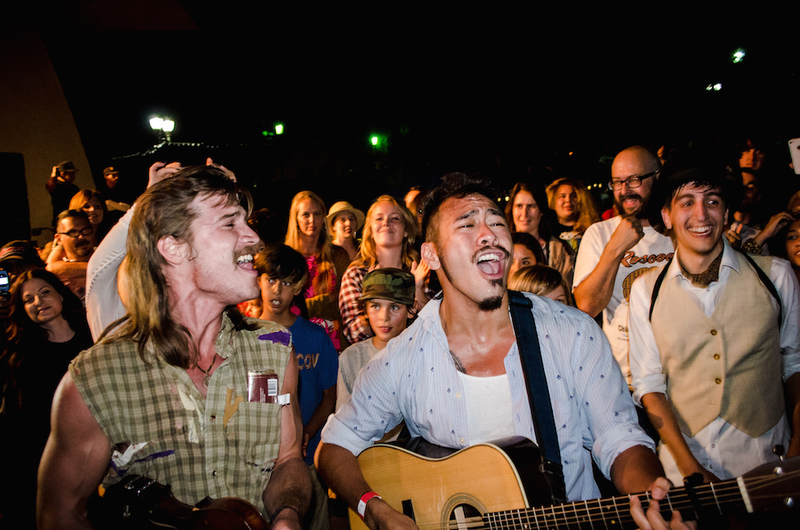 Whiskey Shivers performing at Levitt Pavilion Los Angeles in July 2014. This entry was posted in Levitt AMP, Spotlight Series and tagged Levitt AMP, Levitt Pavilion Los Angeles, middlesboro, Spotlight Series, whiskey shivers on October 4, 2017 by Rounak Maiti.